On a "magical" trip through South Dakota, my friend and I made a point to stop in the town of Mitchell to see what the 3,232 Corn Palace billboards were about. 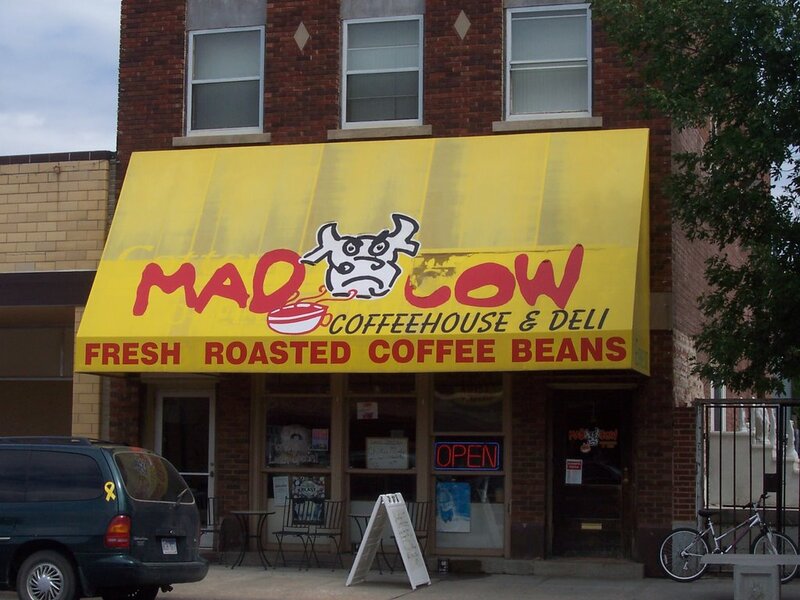 We arrive in Mitchell to see this bohemith building of corn (it was not that amazing) but of more interest, right across the street was this odd-looking coffee establishment. 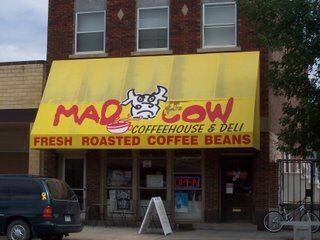 Having driven since Chicago without seeing a coffeehouse, the Mad Cow looked much more intriguing then I thought possible. We strolled in, greeted by the South Dakotian feel of mismatched furniture, the occasional cow art, and the counter at the back. As advertized, they had a coffeehouse menu and a deli menu. I ordered a BLT to satisfy me hunger (it was lunch) and then poured over the coffee menu. They have two roasters from which they get their coffee (I guess they're indecisive in SD). One is Black Sheep and the other is Great Plains, both located in the lovely land of South Dakota. The one I had (they didn't say which it was) wasn't half bad. 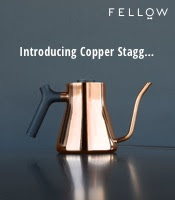 They were firm followers of the "brew in a hot plate coffee maker then transfer to a carfafe" philosophy. 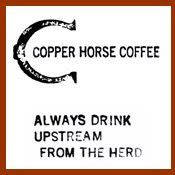 The espresso was another story. The machine looked older then my father and as a result, the shots were a little messy and didn't taste too hot. The tea and chai didn't catch me eye, for we were in a hurry. If you're traveling through South Dakota and you need a cup of joe, you might consider stopping in Mitchell for the coffee and grabbing a glimpse of the "wondererous" corn palace.